Eric Mbatha had a longer relationship with Rorke’s Drift than most artists, being associated with the centre for most of the 1970s. He was part of the second intake of artists who commenced classes in 1971. The early 1970s saw a greater emphasis on intaglio printmaking at the centre, and this included etching, aquatint, drypoint and even mezzotint. Students were also encouraged to experiment by printing etchings in colour, as opposed to colouring prints by hand. Mbatha’s African queens (plate 211) is seen in the Campbell Smith Collection in a black and white version. The same image is an example of an etching and aquatint that was also printed sensitively in colour and where the colour actually enhanced the completed print. In other versions Mbatha selectively inked various sections of the plate in brown, green and black. In this work one can also discern a similar approach to subject matter adopted by Mbatha’s contemporaries at Rorke’s Drift such as Dan Rakgoathe (qv.) and Cyprian Shilakoe (qv.). Born Soweto, 1948. Training 1971: Evangelical Lutheran Art and Craft Centre at Rorke`s Drift. Exhibitions 1976: Black South Africa: Contemporary Graphics, Brooklyn Museum, New York. 1976: Visiting artist at Augsburg College, Minneapolis, USA. Collections Iziko South African National Galllery, Cape Town; De Beers Centenary Art Gallery, University of Fort Hare, Alice. Photograph of Eric Mbatha. Source: Prince Dube. Although formal similarities with the more mystical works of Mbatha’s associates Dan Rakgoathe (qv.) and Cyprian Shilakoe (qv.) can be observed, Mbatha’s own etchings by comparison seem rooted in the anecdotal present. In Family IV, he initially started by drawing with an etching needle into a plate wholly covered in stop-out varnish. The plate was then placed in the acid bath to establish the lines. It was then thoroughly cleaned. More stop-out varnish was applied with a small hard brush in certain areas. The plate was then gently heated and exposed to resin dust and acid baths to obtain varying degrees of aquatint effect. Young Ones and the Gods shows use of similar etching techniques, but with much less use of intaglio line. Although the title suggests a mystical dimension, this is not altogether evident. Principal Otto Lundbohm gave his etching press to Cyprian Shilakoe (qv.) when he left Rorke’s Drift. When Shilakoe died, he left it to Eric Mbatha who later gave it to Dumisani Mabaso. 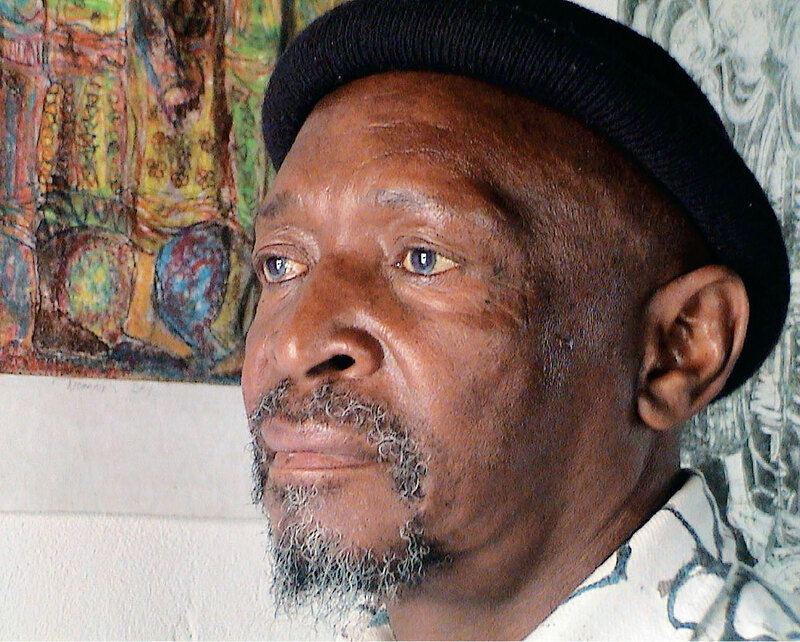 In 1982 Mabaso established the Squzu Studio in Soweto, where he installed it. The Squzu Studio still operates in Bertrams, Johannesburg. See Elizabeth Rankin and Philippa Hobbs. 2003. Rorke’s Drift: Empowering Prints, Double Storey Press, Cape Town, p 217-218.